The winery "Timo Dienhart - Römerkelter" is located in the municipality Maring-Noviand (area Bernkastel ) in the German wine-growing region Moselle, The second part of the name refers to the antique kiln plant discovered in the village in 1977. The traditional family has been practicing viticulture since 1729. There are also rented guest rooms and organized vineyard walks with culinary multi-course menu. The operation is led by Timo Dienhart. 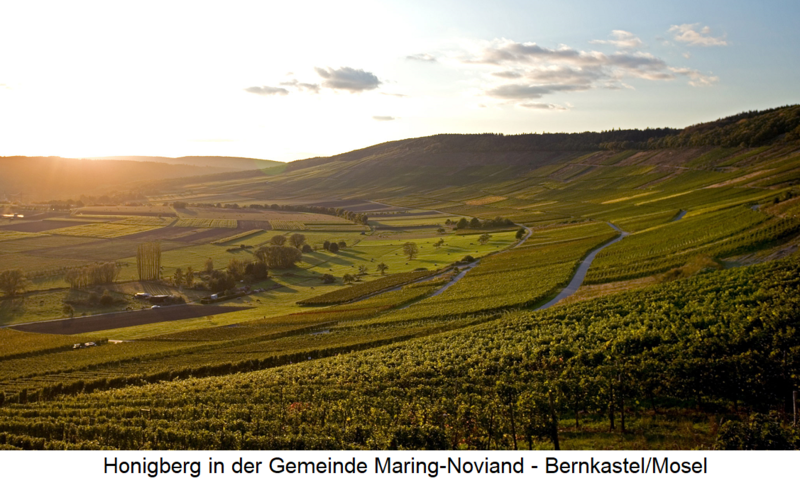 The vineyards cover 15 hectares of vineyards in 70% steep slopes in the individual layers Honigberg, Klosterberg, Roman path and sundial (Maring-Noviand). They are with the white wine varieties Riesling (Main variety with 70% of the stock), Rivaner ( Müller-Thurgau ) Chardonnay. Cabernet Blanc and Sauvignac, as well as with the red wines Pinot Noir ( Pinot Noir ) regent and Cabernet Cortis planted. Since the year 1995 becomes Organic viticulture according to certified rules of ECOVIN practiced. Since the year 2003 becomes organically and managed since 2006 according to certified rules of Delinat. In 2013, a new operating building with optimized processes and ecological Energy technology (heat pump and solar power for complete cooling and heating with ice storage system and deep probes) put into operation. 100% is one spontaneous fermentation with natural yeast flora in temperature controlled tanks. There is an extremely gentle processing with pneumatic Press, On fining agents and enzyme supplements is completely omitted. Depending on the type of wine, the wines in the stainless steel tank, in the big wooden barrel, in Barrique or in stoneware ( ceramics ) expanded. Specialties are the white wine Cabernet Blanc, a Blanc de noirs from Spätburgunder and Riesling fermented in stoneware, which it also called Natural without sulfur additive gives. In weather-appropriate years are also Trockenbeerenauslese vinified. It is also bottle fermented sparkling wine. Perlwein. Rotling. grape juice. vinegar and balsamic produced. This page was last modified at 19 February 2019 at 07:16.